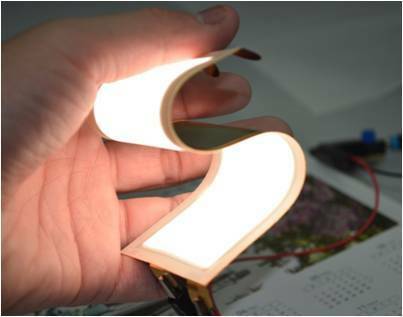 The OLED Light Division of LG Chem has stated that it has completed the development of its new plastic film type flexible OLED panels. The panels are manufactured through new processes and technologies using plastic films which enable the panels to be lighter and truly flexible. The truly flexible characteristics will enable unprecedented luminary designs and even wall paper lighting, as well as new lighting applications for automotive and airplane industry. Technologically, transparent polyimide substrate enables the panel to emit light towards bottom side; a new substrate coating technology has been applied to reduce costs; and additional barrier technologies have been utilized to prevent material degradation against the permeation of water vapor and oxygen. LG Chem is planning to put this new film type flexible OLED panel into mass production in the first half of 2015, which is expected to create significant opportunities for developing the market.